I wrote about Mother Bechamel and her Daughters some time ago and promised to pass along a recipe for Hollandaise Sauce in due time as it is a mother sauce in and of itself. 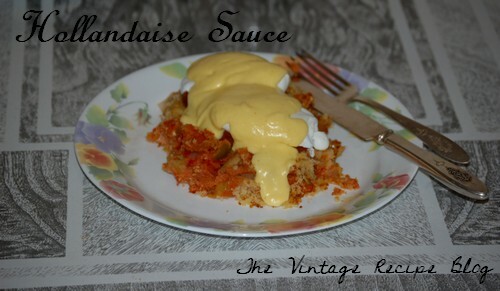 I finally had the opportunity to make Hollandaise the other day when I made a rather rich dinner of Eggplant Creole topped with a poached egg and Hollandaise sauce. To tell you the truth I don't really recommend the combination as the relatively light flavor of the sauce was drowned out by the heavier flavor of the eggplant creole. However if you get back to basics and use the Hollandaise for such things as dressing aspargus or steamed cauliflower or the legendary eggs benedict then you will see the flavor of the sauce shine through into the whole dish not dominating or being dominated in turn. Start off with either a double boiler or a bowl over a pot of simmering water. The water should just be simmering and should never touch the bottom of the bowl. with a whisk, combine the egg yolks and lemon juice until well thickened. Place over heat and while mixing constantly add butter by small bits always being sure to incorporate the butter thoroughly before adding more. When the sauce is thickened to the consistency you would like it (it should be about like thin pancake batter), remove from heat and stir in salt and cayenne. It will thicken as it sits so serve immediately or else thin the sauce with a little hot water before serving. Bearnaise Sauce, where the lemon juice is replaced with a vinegar reduction spiced with shallots, chervil, tarragon and crushed peppercorns. This is a traditional accompaniment to hearty meats and steaks. Mousseline Sauce, Hollandaise folded with whipped cream. Now I have to claim ignorance on a number of these sauces not in that I did not know of their existance but in their use. I could make a study of the various sauces and see what they are normally paired with but such complicated sauces were left to the restaurant in the vintage era while the home cook kept to the more simple sauces with hollandaise being the most difficult to produce so I think I will leave these sauces alone for now and stick with what the home cook could manage back in the vintage era.